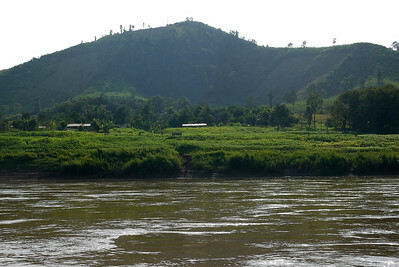 Photos from around Loas, the cities and countryside. 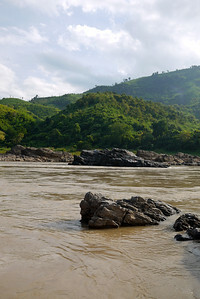 The rusty waters of the Mekong River in Laos. 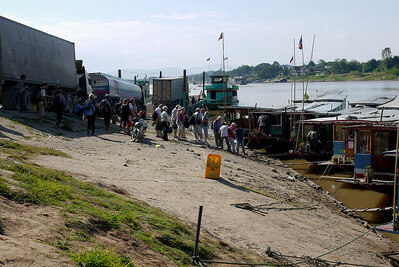 The banks of the Mekong River in Laos, as we board the slow boat from Huey Xai to Pakbeng. 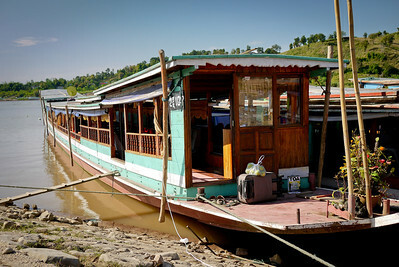 A long wooden slow boat, filled with old bus seats for the long trip down the Mekong River in Laos. 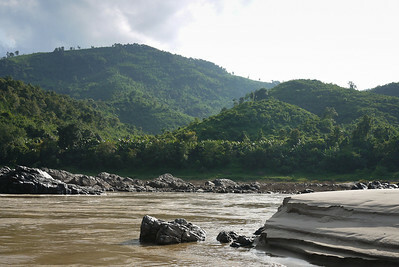 Creative ways to get comfortable on the crowded boat down the Mekong River in Laos. 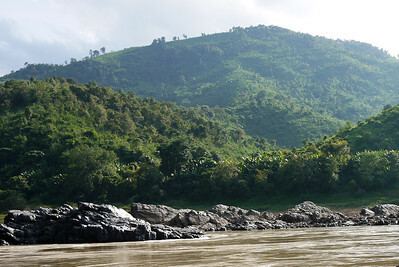 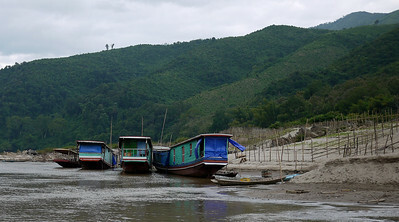 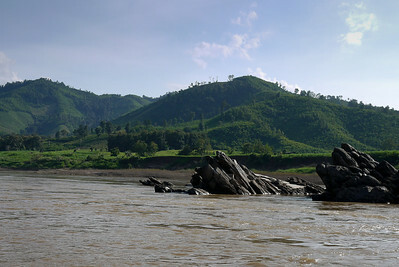 The banks of the Mekong River and surrounding hills on the slow boat down to Pak Beng. 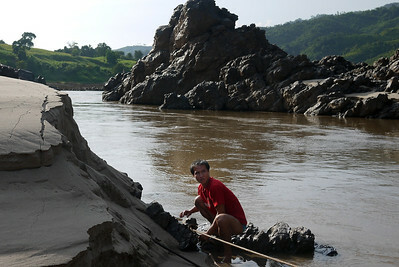 Our boat hit a rock and we had to finangle our way out of a tough spot on the way to Pak Beng, Laos. 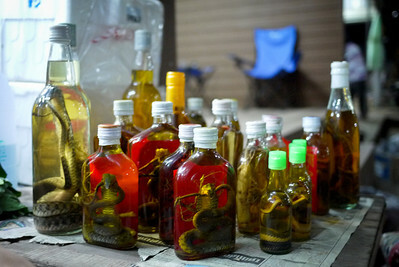 Laos Laos whiskey with snakes and creepy-crawlies from the Bokeo province in Laos. 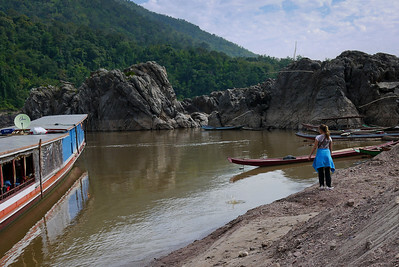 Ana takes some time to skip rocks on the banks of the Mekong River as we travel down to Luang Prabang. 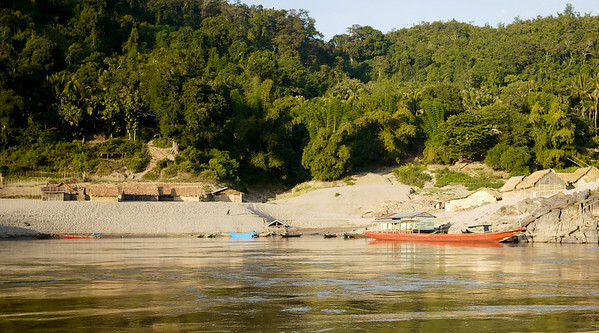 Slow boats and slow days on the Mekong River, Laos. 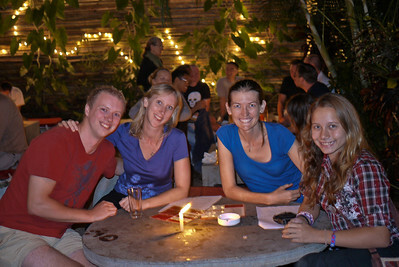 New friends Ane and Jacob we met on the slow boat! 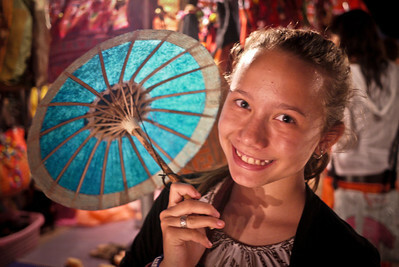 Ana at the nightly crafts market in Luang Prabang, Laos. 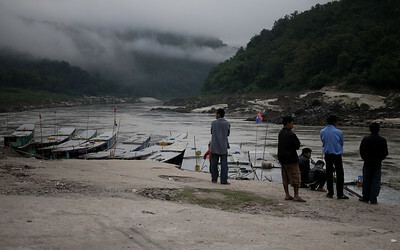 A hazy and cool morning on the Mekong as we board the boat in Pak Beng on our way to Luang Prabang, Laos. 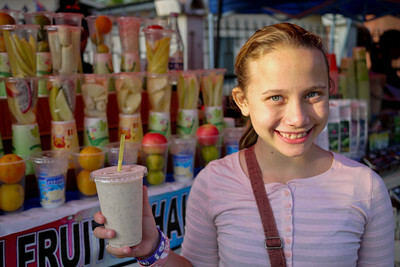 Ana enjoys the street-side fruit shakes in Luang Prabang, Laos. 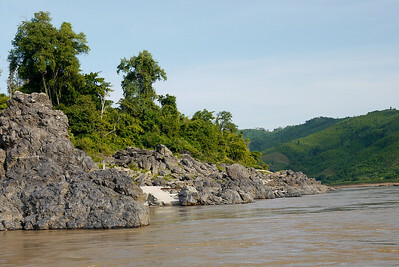 The orange-tinted banks of late afternoon on the Mekong River in Laos. 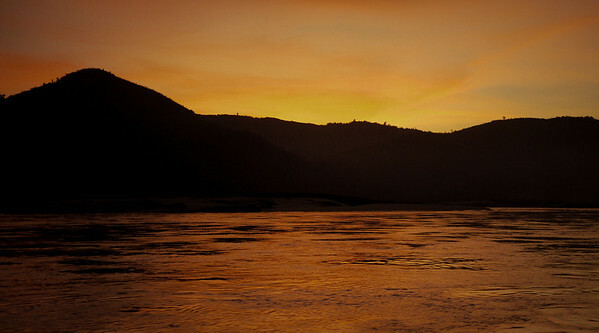 The sun slowly sets with a tangerine sunset over the Mekong River in Laos. 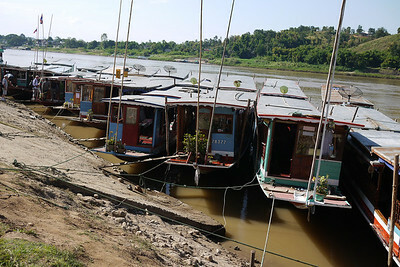 A collection of slow boats waiting to take travelers on the long trip down the Mekong River into Laos. 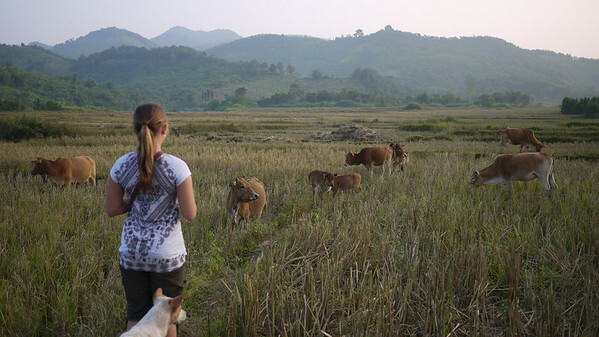 Definitely not raised in the country, Ana was captivated by the cows and the pretty hills of the Sainyabuli province in Laos. 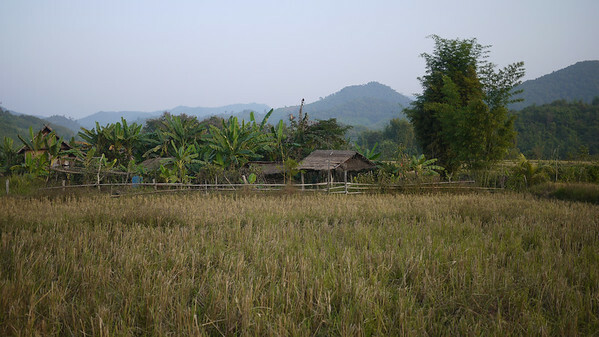 Rice paddies and thatched houses outside in the rural parts outside of Hongsa, Laos.